Peaceful Valley Lodge is brand new rental cabin in Colorado, located on a secluded wooded lot with mountain views, sleeps up to 10 and is close to the resort town of Breckenridge, Colorado. At Peaceful Valley Lodge mountain vacation cabin, you can relax amid a dense growth of pines, willows and aspens while contemplating the view of two of Colorado's highest mountains. Though you are only 12 miles from the international resort of Breckenridge Colorado, you are hidden in a peaceful national forest and you can see no neighbors or hear traffic from your private haven. The only sound is the wind gently rustling through the trees. 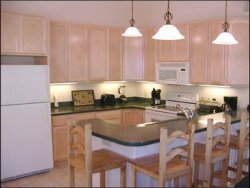 The Peaceful Valley Lodge mountain vacation cabin, built in 2001, is a beautifully furnished two story private mountain vacation cabin rental home that offers 3 bedrooms, 3 bathrooms, a gourmet kitchen and huge living, dining and rec rooms. Six huge picture windows wrap around the main living area and provide jaw dropping mountain views.